The Ramen Bar: New Happy Hour Menu! 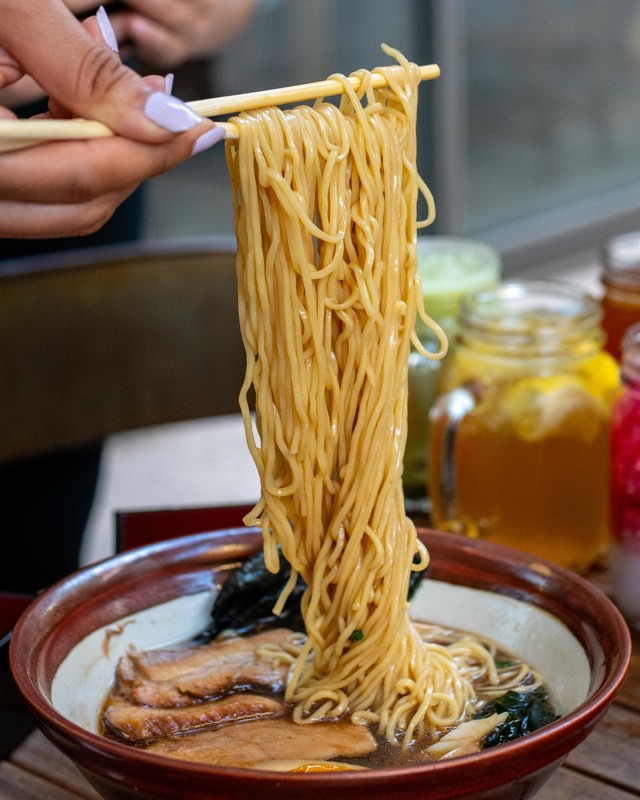 The Ramen Bar, located at 101 California St. in San Francisco, is a popular fast casual spot for the FiDi working crowd, mainly serving awesome ramen and a few other things like poke, kitsune udon, and a variety of tasty pastries. 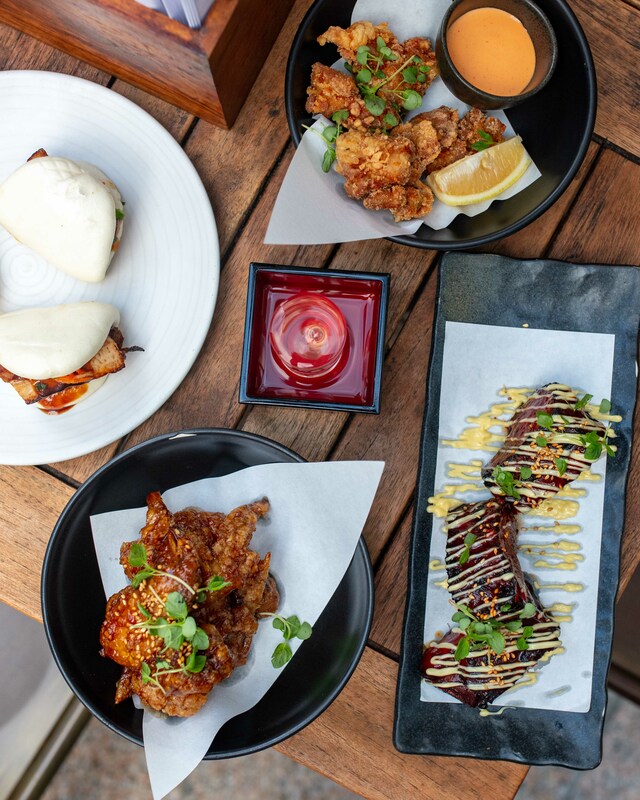 The restaurant was created by the amazing culinary minds of renowned Bay Area chefs Ken Tominaga and Michael Mina, so you know you’re in for a treat when you go! 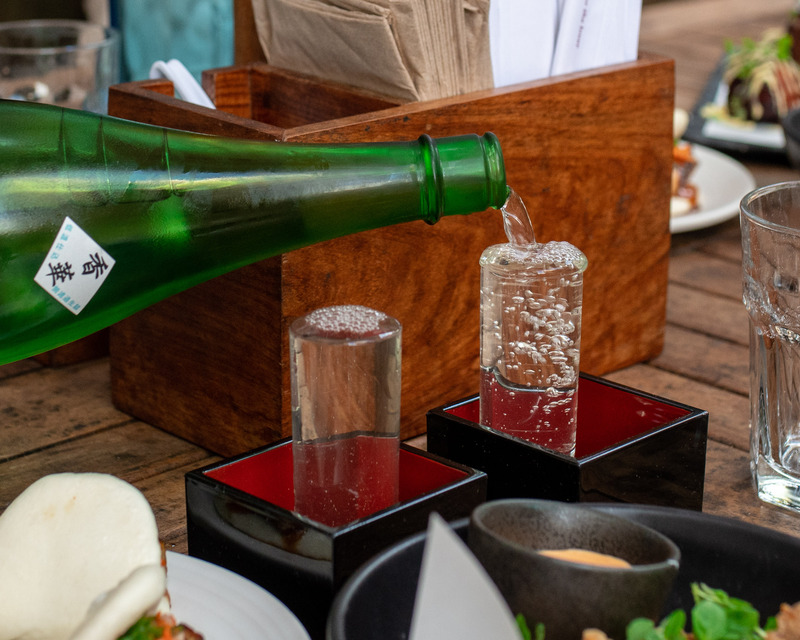 The ramen joint recently started offering a happy hour menu from 4pm – 8pm on weekdays, which includes $5.00 modern Japanese bites plus incredible drink deals, all of which we’ll get into below. Everything was delicious, and the outdoor seating was perfect on a warm evening, and it was in a courtyard kind of area away from the busy streets and sidewalk traffic, which helped create a more intimate environment. You can never go wrong with ramen at The Ramen Bar, and I went for the Shoyu Tonkotsu Ramen during this visit. One of the first things I check for at any ramen place I go to is the consistency and texture of the noodles, and these were pretty darn great. I like my noodles on the stiffer side, and although these were cooked pretty normally, they were not overcooked by any means and had a great, springy feel to them. The flavor of their broth was seriously on point. Shoyu ramen is one of my favorites, but seriously, if you find a place that does shoyu tonkotsu ramen well, order it every time. The mixture of the two flavors is so spectacular because you get the saltiness of the soy sauce with the thickness and richness of the tonkotsu. 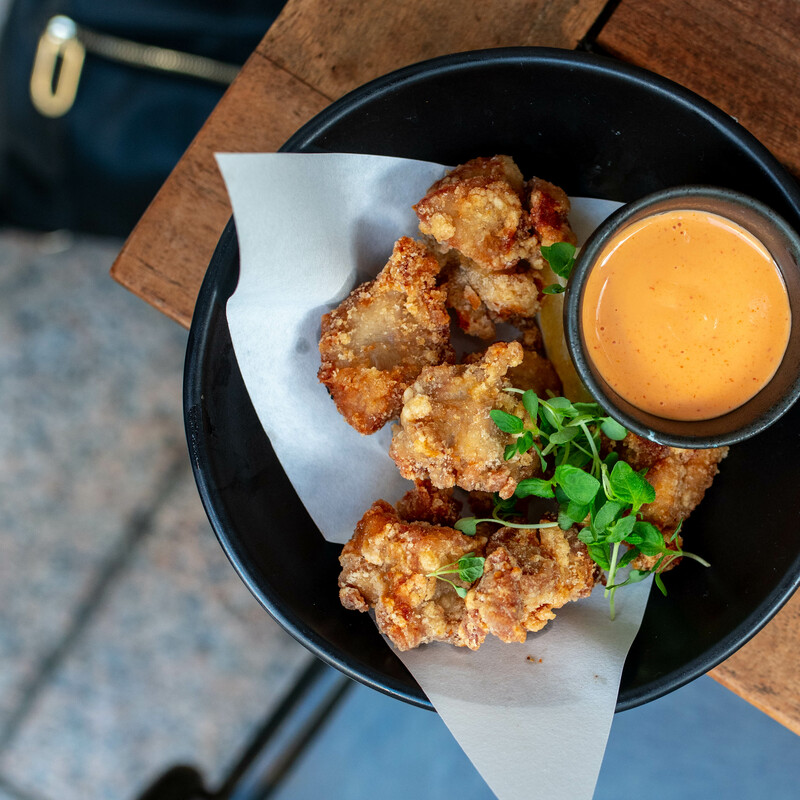 For those not in the know, Chicken Karaage is basically Japanese style fried chicken, and it’s a popular appetizer and beer food in Japanese cuisine, but it’s also used in some ramen and rice bowl dishes. The Karaage at The Ramen Bar was one of the best things I had all night. It was perfectly crispy on the outside and super moist and flavorful on the inside. The sauce was great, too, but you know you’ve hit an awesome recipe right on the nose when you don’t even need to dip it in anything for it to be delicious, and that’s exactly what they’ve done here. PABU is actually the restaurant right next door to The Ramen Bar, but they’re both owned by the same people and share the same head chef. 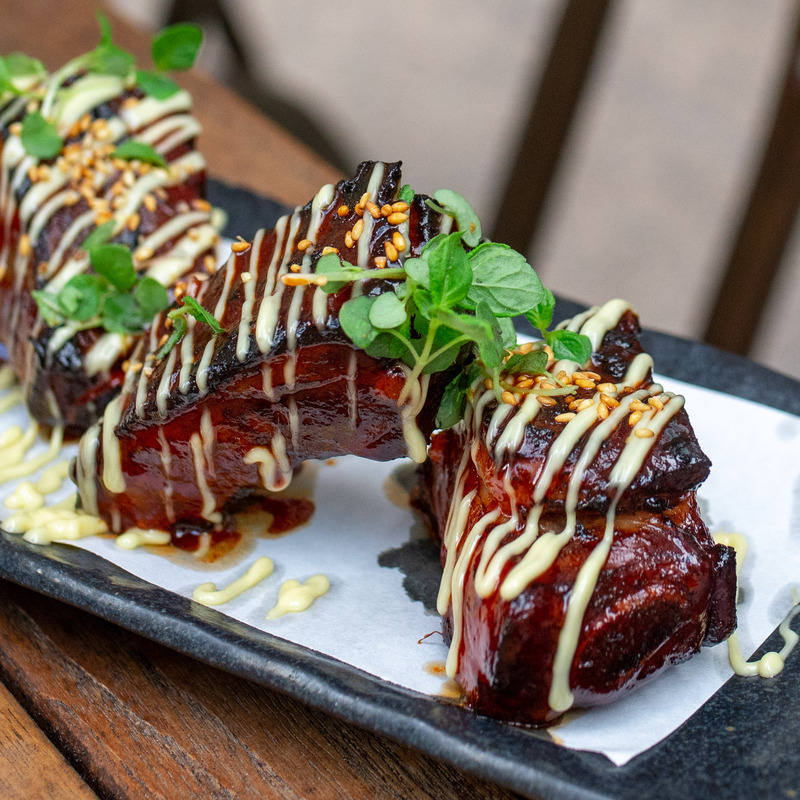 They have a wider range of menu options and they’re more of a sit down style place, but the great thing about how the two restaurants are linked is that you can order these PABU ‘Country’ Ribs during happy hour! They’re prepared slightly sweet and the meat was tender and literally fall-off-the-bone good. They are a bit heavier compared to the other dishes I tried, so that’s something to keep in mind, but I’d still recommend them if you’re hungry! Along with the meal, we got to try some of their amazing Imported Sake. They had a man who actually works in Japan to produce this particular sake (unfortunately I can’t remember the name) there to serve and explain to us some of the traditions and customs surrounding sake at meals in Japan. He placed the sake glasses into those square bowls and one interesting thing he told us was that because this was his sake and we were his guests, it would be rude of him not to over-pour. So the square boxes were there to collect the sake that spilled over. Gotta love learning about other cultures through food! The last dish I tried was their Pork Buns, which were super yummy! You get nice, fat, juicy pieces of pork belly in each one, and that alone makes this dish worth trying. 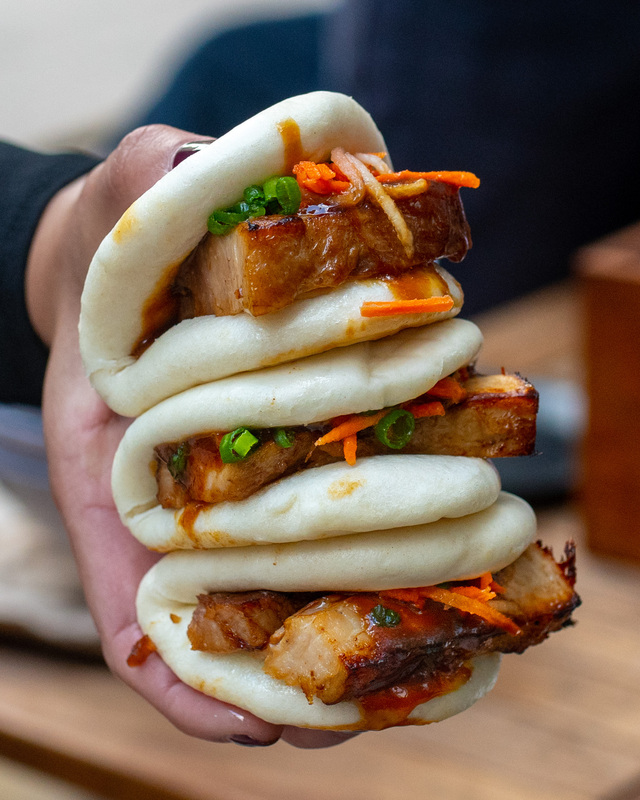 If you’re all about pork belly like I am, this may become your go-to happy hour item. If we had our way, the only possible change we would have made to this one would have been to add more greens of some kind to it to balance out the meat and carbs, but it was still incredible, especially paired with the sake! If you work downtown, The Ramen Bar is one happy hour you’re going to want to add to your list. Delicious, quick, easy, convenient… did I mention delicious? Let us know what you think when you try it out!